All meals are hand-crafted at Bosuiso with fresh ingredients. Vagetables are sourced locally. Every morning fish is delivened from the near by Itoigawa Marina to ensore the freshest Sashimi and cooked fish in the meals. Your will enjoy the healthiest cuisine for your body and spirit. Dinner is served from 6:00 p.m. until 7:00 p.m.
Breakfast is served from 7:00 a.m. until 9:00 a.m.
All meals are served in our dining room. Typically, each meal is comprised of 5 to 6 dishes. Meals are preseuted in the japanese style and are a fusion of japanese and European flavours. In the Hakuba region there are three sources of natural, underground, hot, mineral spring water. At Bosuiso we take only the spring water from the Hakuba-Happo Onsen. This water source provides the health benefits of a strongly alkaline mineral water and is colourless. Separate bathing facilities are provided for men and women. 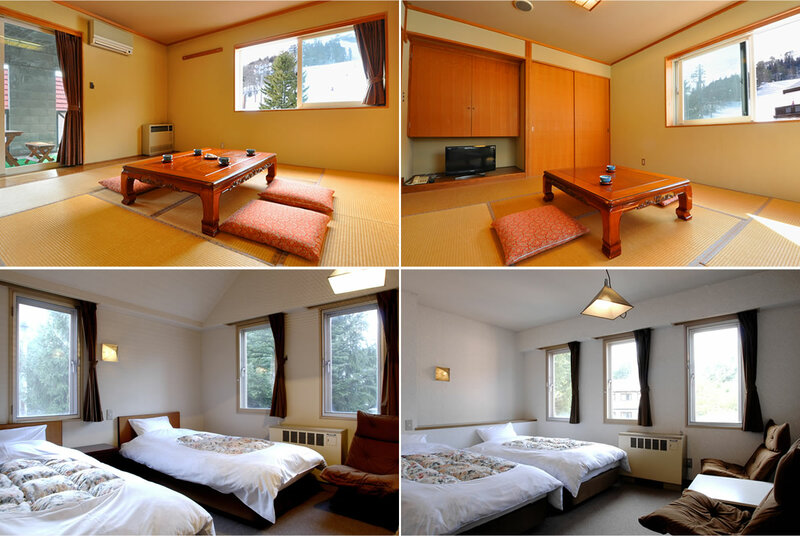 Each of our large Onsen can comfortably accomodate at least 6 people. Onsen are available for use 24 hours a day. We have rooms over looking the ski slopes; some rooms also have balconies. 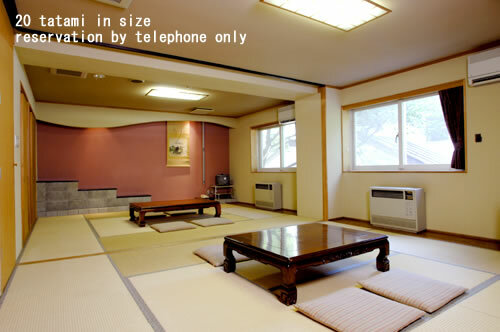 Japanese and Western style rooms are available Japanese style room are either 8 tatami (accommodating 2 to 4 people) or 10 tatami (3 to 5 people) in size. We also have 2Japanese style rooms, 20 tatami in size (reservation by telephone only) Western style rooms are all spacious and available to accommodate 2 or 3 people. *all rooms have a private toilet and hand basin. *all western style rooms have private bath and shower. *2 of our Japanese rooms have private bath and shower. *Hand towels, bath towels, toothbrushes, toothpaste and Japanese bathrobe are provided. *A hot water dispenser is provided. 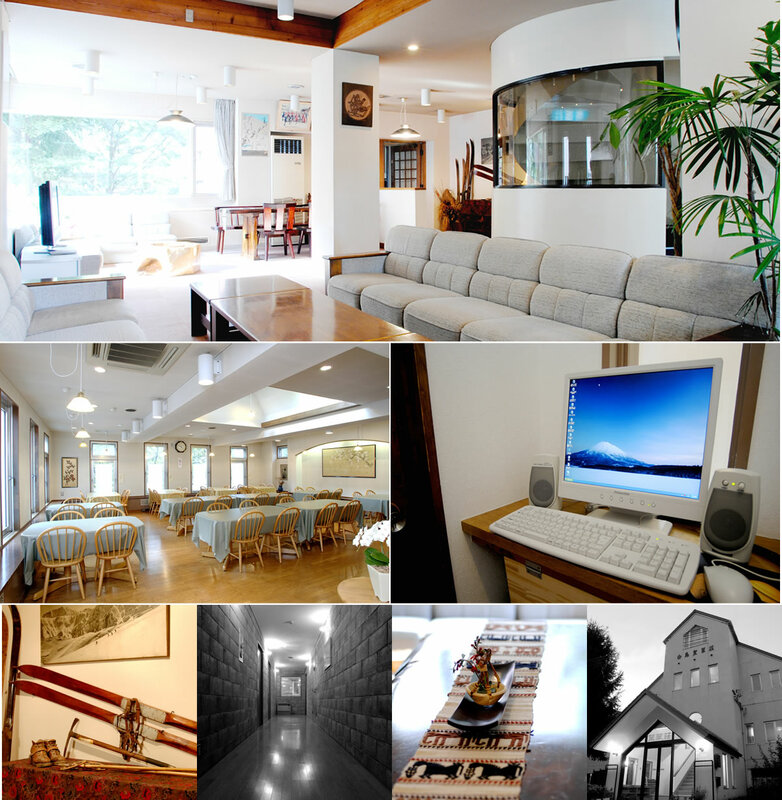 Here at Bosuiso, our staff are at hand to eusure you are able to get the most satisfaction from your stay in Hakuba-Happo. Throughout the year we have English speaking staff to assist you. We hope the facilities we provide will also help you to get the most from your holiday. Hakuba is surrounded by an abundance of batural wonders.The dramatic alpine landscape, natural hot springs and the lush valleys and forest offer an unmatched holiday escape experience.bosuiso is located just 1 minute walk to the nearest ski lift and 5 minutes walk to the Hakuba-Happo Gondola.